Some apps on the Market are a bit weird, but that shouldn’t stop me from reviewing them, right? Today’s app belongs to this particular category of quirky apps. 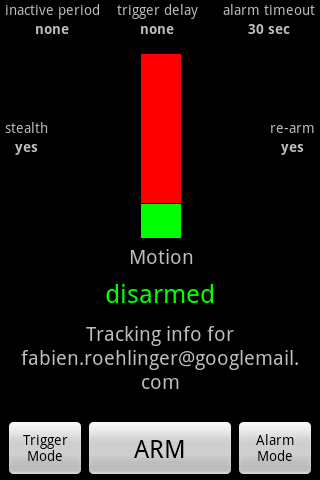 With this app you can change your phone into a mobile security alarm device. Your phone informs you about anyone moving around or making noise in its immediate surroundings. Why do I think it’s bizarre? Well, I can’t think of a situation where this app could come be useful, unless you’re into spying, of course. Alarm sound: Sets off a loud alarm sound. I have no idea what purpose this could serve. I don’t think it would be effective in scaring away potential robbers. Call a specific number: This feature is actually really cool! As soon as the alarm is activated, the app calls a preset number. The person on the other end of the line can talk via the loudspeaker. That could be practical in calming down a small child when it has trouble sleeping. All the alarm events are logged so that you can take a look at what happened while you were gone. Trigger delay: Set up the time delay for the triggered alarm. 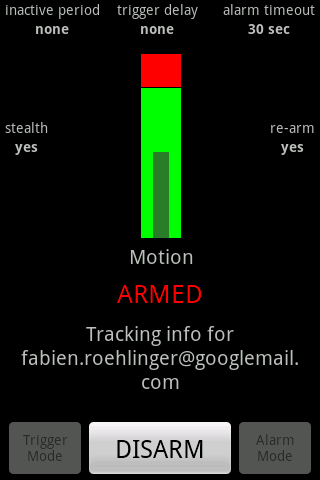 Enable stealth mode: This option keeps the program always activated in the background. Set disarm pin: Set up a password pin to turn off the alarm. Arm after inactive period: Set up times when the app should start up automatically. Alarm timeout: Set up a time limit after which the alarm should turn itself off. User speakerphone: Turns on speakerphone when calling a number. Google account username: Necessary for receiving tracking data. The user interface could've been much much better. Although you eventually can find what you're looking for, it's not a pretty app to look at. They should have put more effort into this app to make it more user-friendly. As is, it's cluttered and plain old ugly-looking. It's a neat little program that may not save your life, but could definitely give your little sister or dog a scare. Some parents may find it useful as a baby phone. Runs fast and great! No complaints. This might be good in a motel room in a high crime city!